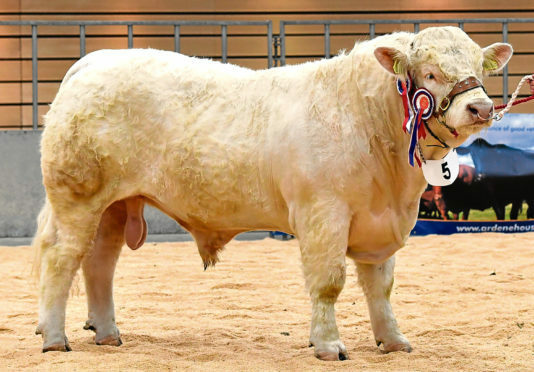 The sale leader was the overall and Charolais champion from the pre-sale show, judged by Andrew Reid of Knockdhu, Hill of Logie, Ellon. Put forward by Jock Wilson, of Kinclune, Glenkindie, rising 22-month-old Kinclune Mascot is by the 20,000gn Beechtree George and out of Kinclune Gaynor. He sold to AJ Blackhall, Millhead, Tarland, Aboyne. Next best at 6,000gn was the reserve Charolais champion – August 2016-born Bonnykelly Marksman, by Gretnahouse Ivory, from Graeme Leggat, Mormond Prop, New Pitsligo. He sold to MJ Forbes, Bogside, Drumblade, Huntly. Limousins sold to 5,800gn for two-year-old Shannas Matchmaker, by Alagils Inkerman, from John and Margaret Penny, Shannas, Clola, Peterhead. He sold to S Hosie & Son, Quarryhead, Rosehearty, Fraserburgh. The Pennys also sold Shannas Masterful, by Garnedd Ferrari, for 5,000gn to the Chapman family at West Cockmuir, Strichen, Fraserburgh. Another Limousin at 5,000gn was the breed champion – Walkers Murray, by Allanfauld Gazza, from Gordon Walker, Easterside, Dunnottar, Stonehaven. He sold to A & C Watson, Glasslaw, Dunnottar, Stonehaven. The reserve Limousin champion sold for 4,800gn to M & J Bruce, Tarool, Watten, Wick. This was Elrick Malt, by Foxhillfarm Impecabull, from Mike Massie, Mains of Elrick, Auchnagatt, Ellon. Another Limousin at 4,800gn was Mauldearie Master, by Cracrop Finch, from A & A Morrison, Bush of Muldearie, Keith. He sold to G W Arnott & Son, Bridgend, Fraserburgh. Simmentals sold to 3,000gn for Tillyeve Harris, by Woodhall Ellison, from Messrs C & M Bruce, Tillyeve, Ellon. He sold to E Edmond & Son, Altons Farm, Keithhall, Inverurie. Messrs Bruce also sold Tillyeve Hakon, by the same sire, for 2,600gn to HJ Arnott & Son, Westerton, Memsire, Fraserburgh. Aberdeen-Angus bulls sold to 4,000gn for Newton Muchalls Edberg, by Duncanziemere Edwin, from Ray Gardiner and Craig Smart, Newton Smiddy, Lyne of Skene. He sold to George Pirie, Northcote, 3 Leys Road, Banchory. Next best for the breed at 3,600gn was Blelack Prince Caleb, by Warrenho Emperor, from Neil and Graeme Massie, Blelack Dinnet. He sold to G M Gordon & Son, Kirkside, Banff. Salers sold to a top of 2,800gn for Darnford Lamar from David Watson, Darnford, Durris, Banchory. The buyer was JM & W Turnbull, Boghall, Kingsbarns, St Andrews. In total, 25 bulls sold to average £3,602.61. Breed averages for bulls were (number sold, average): Aberdeen-Angus, four, £3,173.81; Charolais, seven, £4,228.57; Limousin, eight, £4,462.50; Salers, two, £2,300; Simmental, two, £2,800.